Itching occurs when irritants stimulate the nerve endings of your skin. If you suffer from itching after a bike ride or other aerobic workout, you might be suffering from any of a number of medical conditions. Aerobic exercise can produce a potentially life-threatening allergic reaction; sweat and other irritants can also induce itching and other unpleasant sensations. Discuss the itching with your doctor, who can rule out serious illness and suggest specific treatment and prevention options. Perhaps the most significant cause of itching after cycling, exercise-induced anaphylaxis can occur when physical exercise releases histamine from the cells of your body. Meant to aid in fighting off dangerous intruders, histamine can cause hives — small, raised bumps — as well as itching, redness, difficulty breathing, cramping, headache and swelling. In extreme cases, swelling can spread to the respiratory system and close off your airway or cause your blood pressure to drop. Eating certain foods or ingesting some medications can predispose you to a reaction if you are susceptible. Anaphylaxis is a life-threatening emergency. Call 911 if you suspect you or someone else may be suffering from exercise-induced anaphylaxis. Another exercise-induced allergic reaction, cholinergic urticaria results when histamine production induces hives without the respiratory and circulatory responses elicited with anaphylaxis. 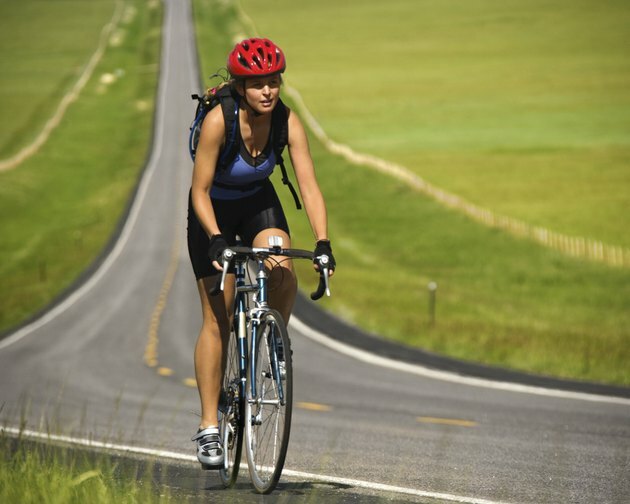 Cycling can increase your heart rate and cause the release of histamine. Hives may be small, distinct raised bumps or diffuse, widespread masses of raised, itchy areas. A study published in 1992 in the "Annals of Allergy" reported that respiratory heat loss, water loss and mast cell activation may cause this type of reaction. Avoid foods that can stimulate a reaction before cycling. Antihistamines may help reduce itching and hives. Heat and sweat can combine to irritate your skin after a bout of cycling. Wearing tight-fitting clothes can trap the heat and sweat produced by your body during exercise. To regulate your body temperature, cells near the surface of the skin dilate during exercise to allow more heat to escape. This increased blood flow can cause skin to feel hot or inflamed. The salt and other minerals released in sweat combined with increased skin sensitivity and the friction caused by clothes rubbing against skin can cause itching and irritation. Prickly heat rash, which causes itching and inflammation, occurs when sweat gets trapped in the pores of the skin. Polyester and other "breathable" fabric can help wick sweat away from skin while cycling and can help you avoid post-cycling itching. Other causes for itching after cycling include dermatitis due to chemical irritants, such as perfumes or dyes in laundry detergents, physical irritants, such as wool clothing, dry skin and reactions to medications or other agents. Consult a medical professional if itching does not resolve within a few hours of exercise or if symptoms worsen. Why Do I Itch When I Work Out?